Recruiting, engaging and retaining talent in today’s wide-open job market just got tougher: 70% of workers say they’re motivated by more than their salary. This presents a new challenge to HR specialists wearing the human capital management hats. If employees are valuing different things at work, their total compensation statement should reflect this. For the HR team, it’s no longer a question of relaying an employee’s total rewards – it’s a question of communicating the rewards workers value the most. To answer that, HR professionals need to swap hats with their marketing team and envision a total rewards marketing solution. If you know your employees value wellness, work-life balance and career advancement opportunities, wouldn’t you want to show them how they are part of their total compensation package? 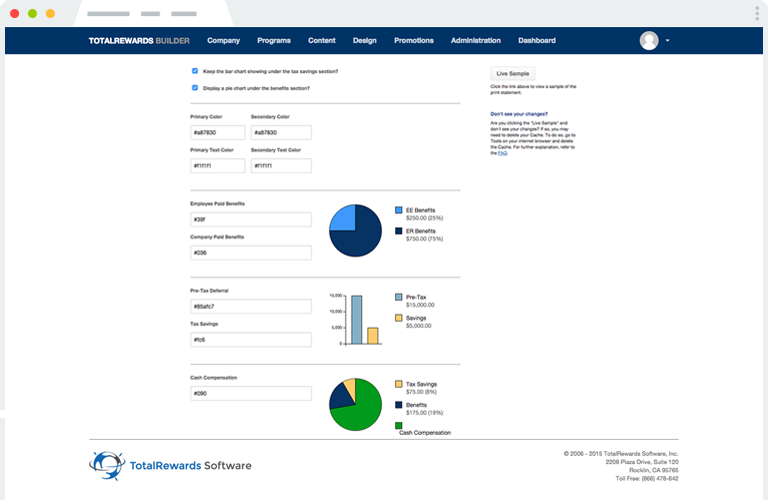 An on-demand, user-friendly software platform stacks value upon value inside your total rewards statements by letting your HR team add benefits programs unique to your workers’ desires. Recruiting great talent is a marketing process that involves selling candidates on your company. You can really boost your company’s pitch by presenting prospects with a slick, organized statement of their potential total rewards to make it clear how much they will earn by joining your company. The marketing process doesn’t stop with employees and candidates. Company execs also want to know the value they’re getting from their human capital. Using the right total rewards marketing solution, HR specialists can easily collect and organize total rewards data into reports showing executive savings, real-time ROI numbers, employee feedback, and more. Keeping great talent at your company and engaged in their work is a constant process of selling workers on what they’re getting at work. By understanding worker values and using the right communication tools, the HR team can keep great talent around by marketing them exactly what they’re looking for in total compensation. Check out our new platform to see how TotalRewards Software can provide a total rewards marketing solution that candidates, employees and executives will respond to.